Easy and Soft Pumpkin Cinnamon Rolls | Pumpkin Cinnamon Bun Video Recipe — Soft Pumpkin Cinnamon Rolls filled with a gooey and sweet cinnamon swirl and topped with cream icing. These incredibly gooey cinnamon rolls would make a delicious treat for Halloween. It’s the best breakfast indulgence ever. Happy happy Tuesday! Oh! Actually, it’s the first Tuesday in October!! So I need to make a correction here — Happy first Tuesday to you all! But this Monday, I did not share any recipe at all. 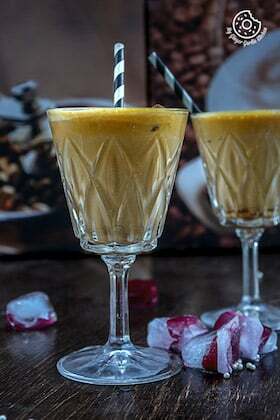 Instead of Monday I am sharing my recipe on a Tuesday! Why am I doing that? Well, I have a beautiful excuse for that and I promise you will love that excuse. Being completely honest here — for me, videos are new toys. But I know, I will learn soon! 🙂 And when sharing a video recipe in Fall, it really doesn’t get much better than a pumpkin recipe. So I decided to share Pumpkin Cinnamon Rolls. And these rolls have taken this Falltastic moment to a whole new level. You can gladly eat them for breakfast, lunch and dinner. This is what I am doing these days! 😉 These pumpkin cinnamon rolls — there’s just something so incredibly awesome about these. 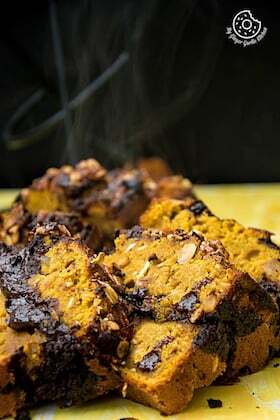 I think it’s the combination of pumpkin puree + cinnamon + brown sugar, which takes these on a whole new level. See, now I am on a total pumpkin kick. You know what, I just love pumpkin and cinnamon together, and will do anything to have pumpkin pancakes or fritters so that I can have more of this flavor combo. I think, that’s gonna be a total comfort food. What say? This is the combo you seriously don’t want to miss out. The rolls — they are so soft, classic, light, fluffy and there’s just enough pumpkin flavor to enjoy. It has just the right amount of pumpkin puree, which doesn’t affect the inherent beauty of classic cinnamon rolls. And then drizzled with cream glaze, they become totally irresistible. I have also sprinkled some salted sunflower seeds on top, and they simply are gorgeous. They are perfectly complementing these fall beauties, and I cannot get enough of them. Does that all not sound AH-MAZING? 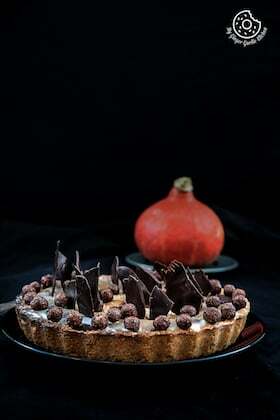 If you are not a pumpkin lover, then maybe this is the time to become one. You are missing something heavenly out here. These are the best pumpkin cinnamon rolls I have ever made. The center bites are the best because they’re incredibly soft and juicy. These are definitely my new favorite cinnamon rolls. The soft insides of the pumpkin dough will make you wish it was pumpkin season all year. The dough is cream-based, but you can use milk instead of cream, that would work well too. But I used cream because I think cream is the best for the softest, lightest, and most tender rolls. Between the cream, pumpkin puree, spices, butter/oil, and egg, the dough rises beautifully and it’s my favorite dough base. The glaze is a simple one made with full fat cream and icing sugar. You can also add cream cheese to it if you wish. You can keep this glaze in the fridge for a week or so. I can never have too much of glaze, so I added according to my taste. For making these, I used bread flour. Bread flour makes these rolls much softer. But you can also use all-purpose flour if you are running out of bread flour. Make your pumpkin dough. Make yeast mixture. Add pumpkin puree, sugar, spices, egg, vanilla, salt, cream and flour. Mix well. Add butter to this mixture and beat until combined. Then add more flour and sugar and mix well to make a smooth dough. Let it rest for 1-2 hours. Roll the dough. After the dough is rolled out, cut into 16-18 pieces. 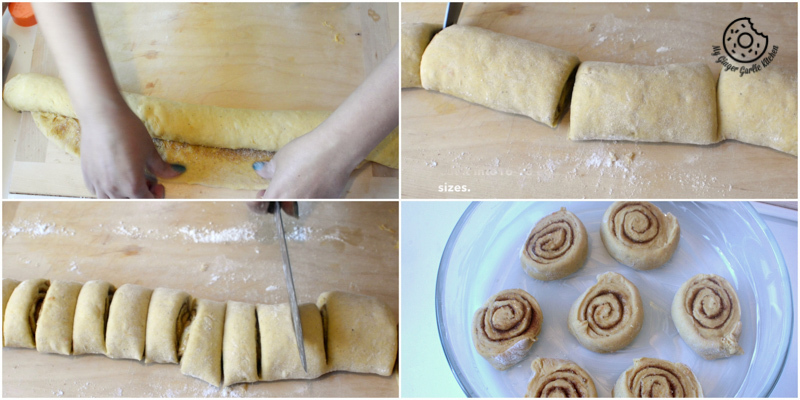 Arrange the rolls into a baking pan and cover with plastic wrap. Allow the rolls to rise again until it gets doubled in size, for about 1 to 1 1⁄2 hour. And wait and wait. That’s the toughest part I must say! Now it’s time to bake them! My rolls took about 25 minutes. Generally they would take 20-25 minutes. And now what? Yippee! It’s time for glaze. The cream glaze. Add 1 cup of confectioners’ sugar and ¼ cup cream. Beat it all into creamy perfection. And slather it all over the warm pumpkin cinnamon rolls. These pumpkin cinnamon rolls taste best when they are warm, but you can have them at room temperature too. And get ready for the gooey brown sugar/pumpkin spice filling, this will get all over your fingers. The sticky cream glaze will melt into your mouth. Soft Pumpkin Cinnamon Rolls filled with a gooey and sweet cinnamon swirl and topped with cream icing. These incredibly gooey cinnamon rolls would make a delicious treat for Halloween. It’s the best breakfast indulgence ever. So what are we waiting for? Let’s now make these Pumpkin Cinnamon Rolls! Take a large mixing bowl. Add yeast and 1 tsp sugar to it. Add warm water and whisk well. Let it sit for 10 minutes. Mix well the yeast mixture, and add pumpkin puree, cream, ground cinnamon, ground pepper, ground ginger, vanilla, salt and mix well. Add 2 cups all-purpose flour and egg. Add oil/butter and 1 cup flour. Mix well for 2 minutes. Add 2 cups flour, sugar and mix well for 5-7 minutes, or mix until it’s all incorporated. Mix well using a hand mixer or standing mixer with the dough hook attached. Add some more flour to mixer so that dough just barely pulls away from sides, and a very soft, slightly sticky dough is formed. Add oil to the dough out of the mixer and pull it together with your hands to form a ball. Place it in a large oiled bowl and cover with a kitchen towel, and place it in a warm spot to rise for about 1-2 hours or until the dough is double in size. In a bowl, mix together the brown sugar, granulated sugar and cinnamon for the filling, set aside. When doubled in size, punch the dough down and roll it out onto a floured surface into a 15×9” rectangle. Spread the melted butter over the top. Sprinkle over the sugar and spice mixture evenly. 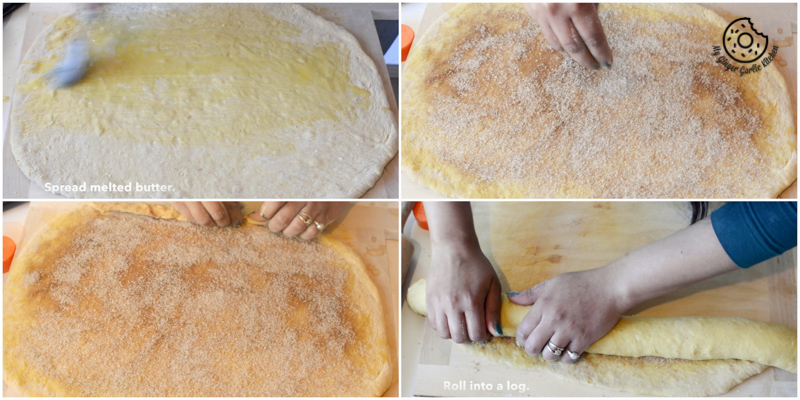 Starting from one of the long ends, tightly roll the dough into a log. Apply water to the edge to seal. Cut into 16 to 18 slices (make sure they are even). Slightly shape the rolls. Now place them cut side down in a well buttered baking pan. I didn’t have a large pan, so I arranged them in (if you have a large baking pan you can arrange them in one pan). Cover with plastic wrap and put them back into a warm spot to rise for another 1-1⁄2 hours. When double in size, preheat your oven at 350°F/15°C. Bake for 20-25 minutes. Bake them for about 30 minutes or until golden brown. Take the out of the oven and let the cool for few minutes. While the rolls cool for a few minutes make the glaze. Mix all the ingredients of the glaze in a bowl and whisk well. You can simply adjust glaze by adding more powdered sugar or milk to achieve desired runny glaze consistency. Immediately pour the glaze over the cinnamon rolls and enjoy! Soft Pumpkin Cinnamon Rolls filled with a gooey and sweet cinnamon swirl and topped with creamy icing. These incredibly gooey cinnamon rolls would make a delicious treat for Halloween. It’s the best breakfast indulgence ever. 1. Add yeast and 1 tsp sugar to a large mixing bowl. 2. Add warm water and whisk well. Let it rise for 10 minutes. 3. Mix well the yeast mixture, and add pumpkin puree, cream, ground cinnamon, ground pepper, ground ginger, vanilla, salt and mix well. 4. Add 2 cups all-purpose flour and egg. 5. Now add oil/butter and 1 cup flour. Mix well for 2 minutes. 6. Add 2 cups flour, sugar and mix well using a hand mixer or standing mixer with the dough hook attached for 5-7 minutes, or mix until it’s all incorporated. 7. Add some more flour to the mixer so that dough just barely pulls away from sides, and a very soft, slightly sticky dough is formed. 9. Add oil to the dough and pull it together with your hands to form a ball. 10. Place it in a large oiled bowl and cover with a kitchen towel, and place it in a warm spot to rise for about 1-2 hours or until the dough is double in size. 1. When doubled in size, punch the dough down and roll it out onto a floured surface into a 15×9” rectangle. 2. Spread the melted butter over the top. 3. Sprinkle over the sugar and spice mixture evenly. 4. Starting from one of the long ends, tightly roll the dough into a log. 4. Apply water to the edge to seal. Cut into 16 to 18 slices (make sure they are even). 5. Slightly shape the rolls. 6. Now place them cut side down in a well buttered baking pan. I didn’t have a large pan, so I arranged them 2 pans (if you have a large baking pan you can arrange them in one pan). 7. Cover with plastic wrap and put them back into a warm spot to rise for another 1-1/2 hours. 2. When the dough is double in size. 2. Bake them for about 25-30 minutes or until golden brown. Take them out of the oven and let them cool for few minutes. 4. While the rolls cool for a few minutes make the glaze. 6. Mix all the ingredients for the glaze in a bowl and whisk well. 7. You can simply adjust glaze by adding more powdered sugar or milk to achieve desired runny glaze consistency. 1. Immediately pour the glaze over the cinnamon rolls and enjoy!